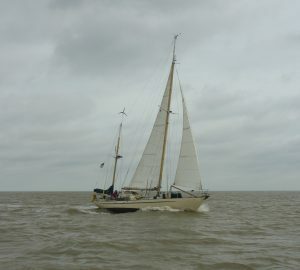 I sailed from Orford to Lowestoft yesterday. 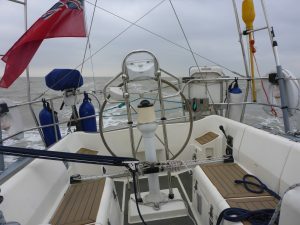 It was a frustrating trip with not much wind and a brief squall as we were approaching Lowestoft. ‘Endeavor’ arrived this morning early!! I checked AIS Marine Traffic last night and could see that 10 hours previously ‘Endeavor’ were well in to the North Sea from Ijmuiden. They were going to arrive long before their 1100 BST ETA. I was very happy to be woken at 0730 by hearing their quiet voices as they silently came alongside ‘Talisker 1’ and rafted to us. It was great to see them. 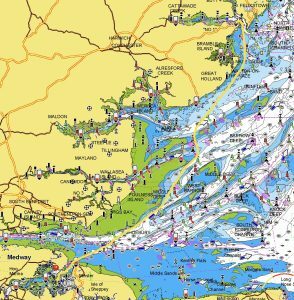 Tomorrow both boats leave early for Ipswich. 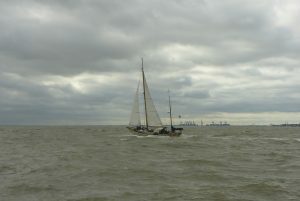 ‘Endeavor’ and ‘Talisker 1’ had a beat down from Lowestoft on Tuesday. 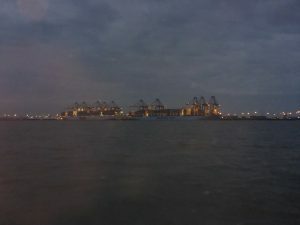 It was great seeing ‘Endeavor’ sailing for the first time. 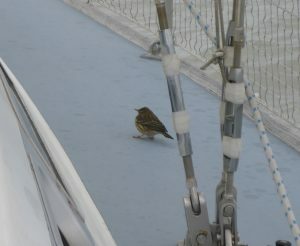 Our 70 NM trip together from Stromness to Fair Isle had been a motor sail in practically no wind. I had hardly seen them on passage Fair Isle to Lerwick when there was poor visibility. 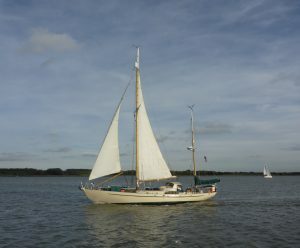 We sailed up the Orwell to Ipswich Haven and joined ‘Sentijn’. 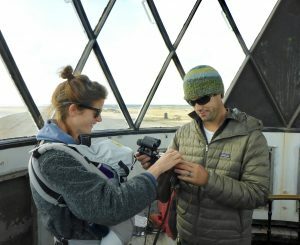 John and Kara Pennington, with baby Dean look like they are in Suffolk for the winter working on their new boat. John and Kara wrote a fabulous book on their circumnavigation. This book is an absolute MUST read for non sailors and sailors alike. For a first time author it’s superbly written and very funny. But make no mistake! 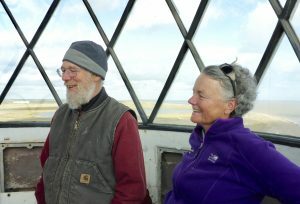 John and Kara are right up there with the small band of serious long distance cruising sailors who are quiet, inquisitive and generous. They are incredibly self sufficient and skilled at what they do in one of the harshest environments in the world. It’s very nice for Kara and John to get to know Candy and David. 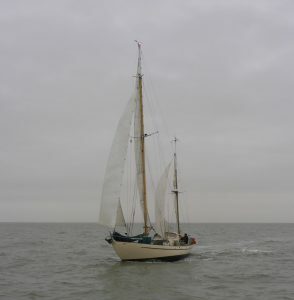 And Australian SV ‘Taipan’, Kris and David, return to Ipswich this evening!! James Robinson has been very kind. Between the two of us we have been driving the two crews around Suffolk. 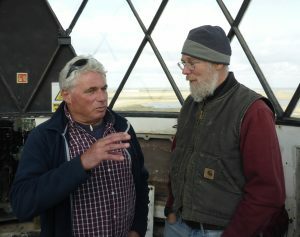 James arranged a fabulous visit to Orford Ness Light House. 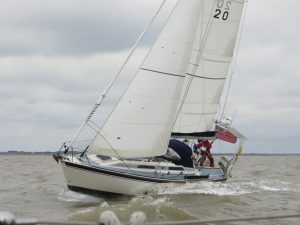 Tomorrow James R is taking John to meet Andrew Moore at Felixstowe Ferry! With any luck Andrew will be able to help with the work that needs to be done on ‘Sentijn’. 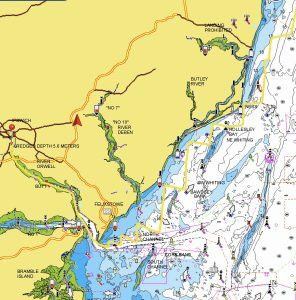 We are at anchor in Dead Mans Hole, Stangate Creek, River Medway. Earlier we were rafted to ‘Endeavor’. 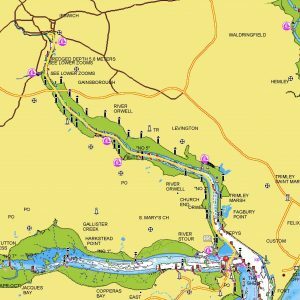 They head up to London on the flood very early tomorrow morning to winter at St Katherine’s Dock and we sail back to Suffolk, leaving early afternoon to catch the ebb up the coast. 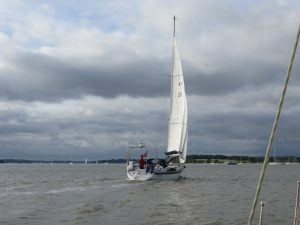 Yesterday afternoon both boats left Ipswich Haven and then spent the night in Harwich. Waiting for the lock. 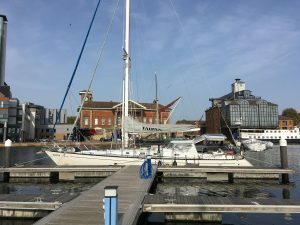 Ipswich Haven Marina. ‘Endeavor’ ahead of us. Dead Mans Hole, Stangate Creek. 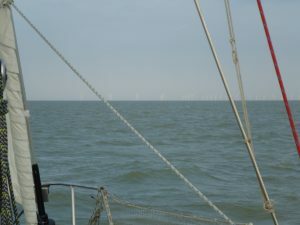 and sailed all the way in north easterly winds that were at times light. The flood was strong and gave us a great lift. I was able to take great pictures of ‘Endeavor’ under full sail with mizzen and mizzen stay sail too. She’s a pretty boat. 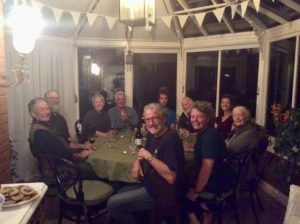 On Monday night Doc and James R came to supper with Sally, me and my Mum. David and Candy, John and Kara (with baby Dean) and Kris and David from ‘Taipan’ also joined us. Great fun. 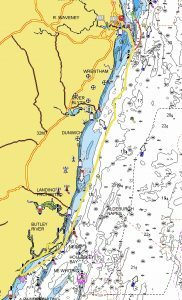 The return tomorrow might be the last sailing of the year. 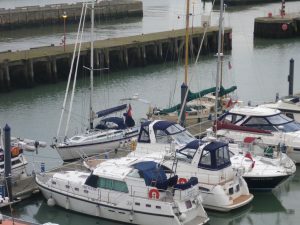 We are in berth 60, Suffolk YH west end. It was quite awkward turning round in a poorly lit marina in the dark. 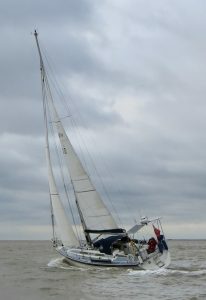 There was insufficient space to turn in one go and a bit of manoeuvring was necessary, not helped by a strong southerly wind. 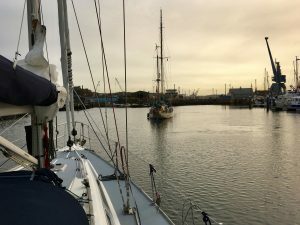 We had no chance of coming alongside our finger pontoon in the wind and with our prop walk so we came alongside our new neighbour. 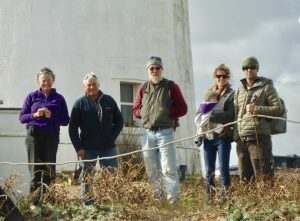 We were very well fendered … so were they. 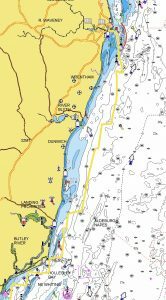 It’s always good to have mooring lines prepared port and starboard even if you know which side your supposed to be. You never know! A single handers trick. A nice chap on a motor boat gave me a hand to throw lines across to our finger. Steve is a single hander too and a live aboard. He’s not decided if he’s spending the winter here or in Holland. Today was a fast sail in southerly winds that were a fairly consistent 5 and sometimes 6. It’s got stronger tonight as I sit here typing and securely berthed. 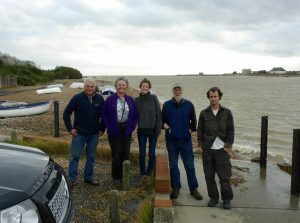 There are strong winds forecast for this week end so we got in Suffolk Yacht Harbour, just in time. We woke fairly early to find ‘Endeavor’ gone. 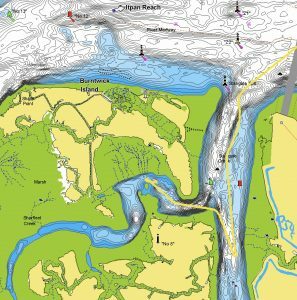 They left Dead Mans Hole an hour before LW Sheerness to arrive in the Thames at slack water and then take the flood up to Tower Bridge. 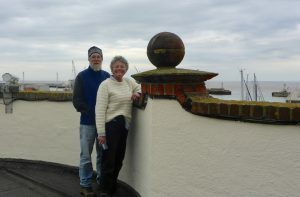 We were waiting for HW Sheerness to then take the ebb up to Harwich. 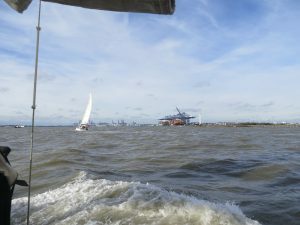 We actually arrived Harwich just after LW. The flood had just started in the Orwell so we had a current with us just about all the way. 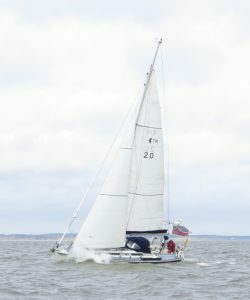 At times we touched 9-10 knots off the Maplin Sands and sometimes 8-9 in the Wallet. 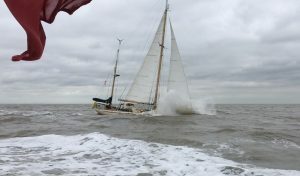 We fought the last of the flood leaving the Medway but the southerly winds were building nicely by then and with a reef in the main we were making good speeds. We experienced an unpleasant exchange with a ship. 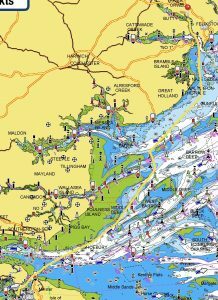 A very unusual experience with professionals in UK waters. 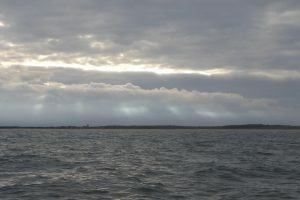 We had just crossed the deep water channel at Sea Reach 2 North & South and were heading for Blacktail Spit. A ship outward bound from London left the deep water channel and seemed to be closing on us fast as we headed north. 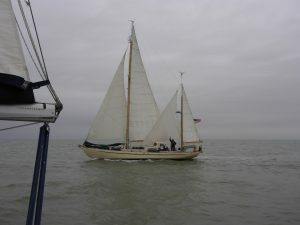 Although we were the stand on vessel I did not want to impede her progress if, they too, were heading up Middle Deep. I gave them a call on 16 not wanting to clutter London VTS on 69. I had been monitoring duel channels. Channel16 and London VTS on 69. 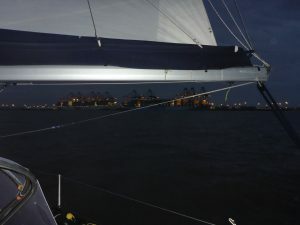 We switched to 06 and I asked them if I was impeding their progress and a foreign voice replied that they were ok and comfortably overtaking on our starboard side. The ships port side. An English voice then came on the VHF, from the ship, to lecture me on monitoring 69! I didn’t argue. But it was somehow …. just rude. There was an unpleasant emphasis on ‘Sir’ with that undertone of ‘No Respect’ and then a repeat of the lecture again for good measure. I bloody well had been!! Definitely obnoxious! Or perhaps his Mrs had given him a bollocking that morning!